Hi Ken: I was watching commercial passenger planes pass over the area. The sky was blue the weather conditions were fine and it was perfect for spotting aircraft. I was looking towards the east watching a passenger plane that was quite far away when all of a sudden I spotted a white object that appeared to be heading towards the plane from above. 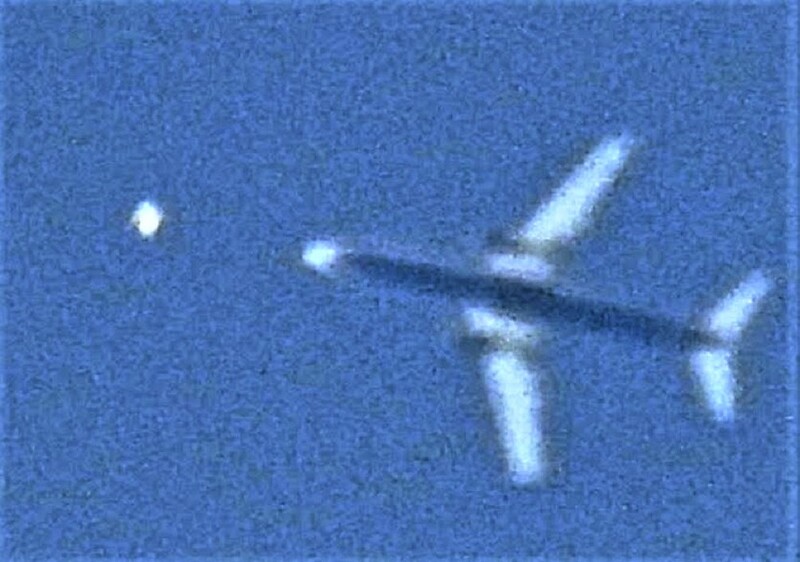 I was looking through the viewfinder of my Nikon P900 camera at the time so I immediately started to take photographs of the object and the plane. I managed to take five photographs in total capturing the movement of the object as it flew directly in front of the plane. The object was far to large and fast to be a drone. The object clearly had no wings or visible means of propulsion. The object was definitely strange and out of the ordinary. I watched as the object and the plane flew across the sky together it was weird. The object matched the planes airspeed exactly while maintaining it’s position directly in front. The pilots must have been very alarmed and worried that they were going to collide with the object. As the plane flew off into the distance I saw the object move away from the plane and then I promptly lost sight of it. I have witness similar incidents like this before and I often see objects like this near or around commercial aircraft. This is the main reason why I now regularly photograph commercial aircraft flying over the area. In the news these objects are conveniently wrongly reported as drones which they are not. After decades of research I have established that these objects are in fact multidimensional and are alien in nature. I know a lot of people who can’t handle this fact but it’s the truth. We are not alone in this multiverse. ‎The photographs were taken on 30th of ‎July ‎2018, 1:27 PM at Newton Abbot Devon England. All the best John. Have a great week my friend. This entry was posted in ABDUCTION, best ufo photos, incredible ufo photos, MISSING TIME, top ufo news, UFO, UFO ARTICLES, ufo news, ufo photos, Uncategorized and tagged ABDUCTION, ALIEN CRAFT, ALIEN CRAFT LANDING, ALIEN CRAFT PHOTO, ALIEN ENTITY, ALIEN IMAGE, ALIEN IMPLANTS, ALIEN PHOTO, ALIEN PICTURE, AMAZING UFO PHOTO, BEST UFO PHOTO, best ufo photos, CAMERA CAPTURE UFO, CIRCLE LIGHTS UFO, close encounter, CLOSE ENCOUNTER UFO PHOTO, DISC, FLYING SAUCER, HIGH STRANGENESS, HUMANOID, incredible ufo photos, KEN PFEIFER UFOLOGIST, light photo, MISSING TIME, saucer, SPACESHIP UFO, top ufo news, ufo, UFO ARTICLES, UFO LANDINGS, ufo news, ufo photos by KEN PFEIFER. Bookmark the permalink.